Morphje is building a geodesic dome. This page houses all related information about this project. 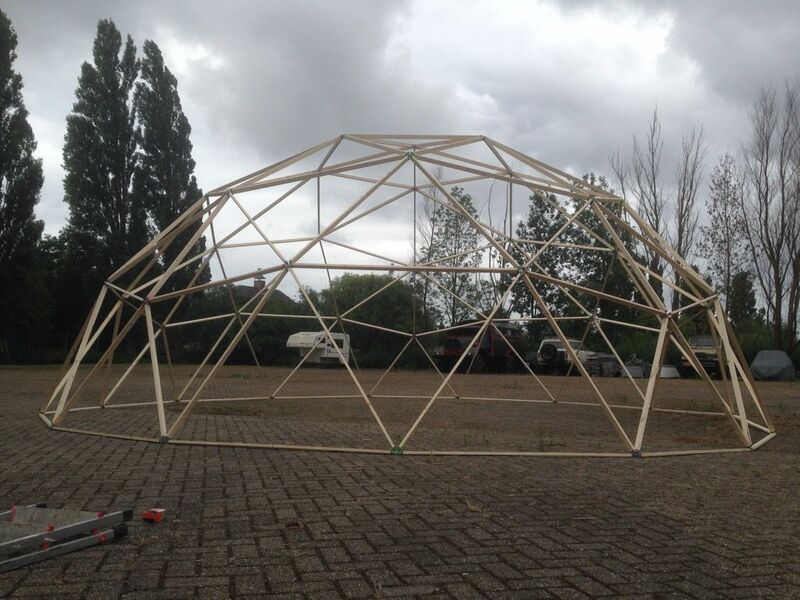 I've always wanted to build a geodesic dome. That's basically it. I positively enjoy the beautiful shape, it's geometrics and sturdiness using only basic materials. The round shape makes it an ideal candidate for high wind sites, since the drag coefficient is very low. For a 9.1 meter dome, the wind load is only 500 KG in a gale force wind (8 bft). At the hackerspace, bigger is better and when doing it's worth overdoing. The only thing i'm overdoing is it's size: 9.1 meter in diameter. All materials are chosen for lightweight, low cost, but still be able to carry my own weight. Final conclusion: It works like a charm, full steam ahead! There are 2 metal parts. A collar and a pipe. The collar is used to prevent the wood from splitting. I procured square tubing 50x25x1.5mm, inner dimensions are 47x22, perfect for the wooden struts. There were cut on an industrial cut off saw. I can highly recommend using a decent machine and use plenty of cutting fluid! Cutting each collar takes about 30 seconds. Using a disc grinder will use more material (you cannot cut straight), go through a lot of discs (one disc will only cut 10 collars i reccon) and setting up each cut will take up more time. alternative: 50kg dyneema kite rope. Wrap it around tight and fasten it like a hangman noose. Glue into place. Or use wet rope and wrap it around tight, when the rope dries it shrinks. The pipe is cut, deburred, scored using a blunt chissel type of tool and then whacked flat on the anvil. It took me the better part of the day (10 hours including breaks and dinner) to finish these pipes. Whacking 265-ish pipes takes at least 5000 hammer blows and my shoulder was pretty sore the next day.